This week is National Eye Health Week. It’s estimated that 2 million people in the UK are living with sight loss, but what if one of those people is your child? How do you know how to support them if you don’t know what it feels like to be visually impaired yourself? We spoke to award-winning beauty, lifestyle and disability blogger Elin Williams about living with her deteriorating eye condition Retinitis Pigmentosa and what she wishes her parents had known about her visual impairment when she was younger. If your child lives with a vision impairment or any other disability, it can be difficult to know how to support them, especially if they’re only young and they don’t know what support they need themselves. I know that my parents struggled in terms of pinpointing what support I needed when I was younger and it’s something we’ve spoken about more openly as I’ve grown up. I was a really shy child, I didn’t know how to voice my opinions, my fears or what I was struggling with, especially when it came to my vision impairment. I was diagnosed with a degenerative eye condition, Retinitis Pigmentosa, when I was six years old and it took many years for me to understand it and what I needed in order to accept and deal with it. Here’s just a few of the tips I would give to parents of visually impaired children, some of them are things that would have helped me when I was younger so I’m hoping they’ll help you too. I think one of the most important things is to talk about your child’s condition, whether that’s as a family, with a professional or with someone else who is experiencing something similar. My family and I never spoke much about my vision impairment (VI), this was purely because I didn’t have much confidence when doing so and it can be a difficult topic to address sometimes. My parents have told me that they would have found it easier to talk to me about sight loss if they had spoken to other parents or a professional about it. A small conversation to address some challenges or how the condition is affecting your child could be all you need to start with. This is something that my parents said they wish they’d done more of. Since I was a really shy child, the idea of attending things such as activity weekends never appealed to me but looking back now, I wish I had stepped out of my comfort zone because I know how beneficial it can be to meet other visually impaired people. There are activity breaks that have been designed for families of visually impaired children and it’s a great way for children and young people to meet others who can relate to their story and experiences. I think it’s incredibly valuable to meet others who are experiencing something similar to you, I’d say that it’s just as important for the parents as it is for the children. I’ve had a fairly normal childhood despite my VI, my parents never wrapped me up in cotton wool and I was able to do the things that others my age were doing. This allowed me to feel ‘normal’ whatever that might be. I would go on bike rides with my brother, go to the park with my friends in the summer and do all sorts of tricks on the trampoline. I know that my parents would worry when I did those things but they never stopped me from doing them. Of course, it’s important to address that some activities or tasks might be a little more difficult due to your child’s VI but it’s important for them to figure that out for themselves and determine the best ways of making something more accessible to them. Ensuring that the right support is in place in school for example is so important. My time in education was a really difficult one for me and I know that it would have been even more so if I didn’t receive the support I was lucky enough to have throughout my time at school. I had work adapted for me, a qualified teacher of vision impairment (QTVI) came to see me every week and she taught me braille and how to touch type. I also had support in lessons, a reader during my GCSE and A level exams and a really supportive TA who ensured that my work was in the correct format at all times and who also ensured that my teachers were aware of my needs. All of the above made my time at school so much easier. Knowing that I had the right support in place put my mind at ease and if anything was out of place, my parents always supported me and made sure that whatever the problem might be, it was always resolved. It’s easy to have the things that your child might need extra support with in the forefront of your mind but it’s equally as important to focus on their strengths and not to lose focus on what they can do. If your child likes to draw then encourage them to carry on, even if it’s not the most perfect piece of art, it’s important to let them do what they’re passionate about and not to let their VI get in the way of that. Personally, I love music and I wanted to learn to play instruments such as the piano and the harp when I was in primary school and so I did. My mum contacted the RNIB who adapted the music sheets into my preferred format and so I was able to learn to play my favourite instruments just like anyone else. Sight loss is often a learning curve, it’s definitely something that I’m still learning from and I know that my parents are too. It’s inevitable that you and your child will come across some hurdles and challenges but challenges are meant to be overcome. As long as you keep communicating openly with each other, I think you’ll come to understand what can be done in order to overcome those difficult times. 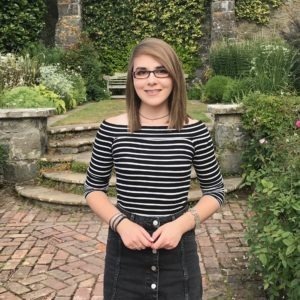 You can read more about Elin over on her blog and don’t forget to follow the #EyeWeek and #VisionMatters hashtags over on Twitter all this week for more advice and information about visual impairments. Offers support, advice about benefits and courses so people can meet and share experiences with those in a similar situation to them. RNIB also has a children, young people and families service which connects families and also offers early years and transition support as well as books, magazines and curriculum materials. Supports children and young people who are blind or partially sighted and their families across the UK. VICTA are also currently working in partnership with RNIB on a product grant programme focused on supporting independent study using technology. If your child is registered blind or partially sighted and a UK resident aged between 11 and 25, they could be eligible for an Apple iPad Air 2 with a case. VICTA also offer other grants too.